Grace, mercy, and peace be unto you from God our Father and Jesus Christ our Savior and Lord. Then many of the Jews which came to Mary, and had seen the things which Jesus did, believed on him. But some of them went their ways to the Pharisees, and told them what things Jesus had done. Then gathered the chief priests and the Pharisees a council, and said, What do we? for this man doeth many miracles. If we let him thus alone, all men will believe on him: and the Romans shall come and take away both our place and nation. And one of them, named Caiaphas, being the high priest that same year, said unto them, Ye know nothing at all, Nor consider that it is expedient for us, that one man should die for the people, and that the whole nation perish not. And this spake he not of himself: but being high priest that year, he prophesied that Jesus should die for that nation; And not for that nation only, but that also he should gather together in one the children of God that were scattered abroad. Then from that day forth they took counsel together for to put him to death. Our theme for Lenten Vespers this year is the Ironies of the Passion. An irony is when the intended meaning of our words is different than the actual meaning of the words. An example of irony is when someone responds to a ridiculous suggestion by saying: That’s a great idea. A situational irony is laughing because someone slips and falls on the ice and you end up falling too. A verbal irony would a 350 pound man with the nickname of Tiny. During the Civil War the Southern Confederates considered Abraham Lincoln the biggest liar to ever occupy the Oval Office so they nicknamed him Honest Abe. We see irony in Caiaphas the High Priest who unintentionally revealed what God had in mind though he intended something totally different. God used Caiaphas, an unbeliever, to proclaim the Gospel without him ever realizing it. Caiaphas was a schemer, a political operative and an insider firmly entrenched in political and religious power. He was the ruler of the Sanhedrin, the Jewish Council, who along with the Roman government, controlled the Jewish nation with an iron fist. He was a power player who ruled the religious and political system like the Mafia. If you got in their way Caiaphas, Herod, or Pontius Pilate would make sure you disappeared. Caiaphas had a Jesus problem. Our Lord was causing them big trouble. So they called the Sanhedrin together to discuss it. What was their problem with Jesus? Was He hurting people? Was He threatening anyone? The problem of Jesus: The immediate problem was Jesus had just raised a man named Lazarus from the dead. Our Lord had performed many other miracles in the past that were ignored by the religious leaders, but raising someone from the dead who had been in the tomb four days in front of dozens of witnesses could not be overlooked. And because of this miracle many of the Jews were beginning to believe on Jesus. Some who saw the miracle ran to tell the Pharisees what He had done and this prompted the emergency meeting. As the meeting began the religious leaders poured out their anxiety about Jesus. What were they going to do? He was becoming a serious threat to them. The conversation was going in every direction, but there was one theme, if they didn’t do something about Jesus, the Jewish people would believe on Him and when that happened the Romans would come and take away their place and their nation. They would lose their position, power, and wealth. They had to do something to safeguard the nation, their wealth and power. The religious leaders were panicking and Caiaphas saw an opportunity to secure his authority. He saw the bigger picture, an ability that had kept him in office for thirty years. After listening to the other members of the council he finally took charge: Ye know nothing at all. You don’t realize that it is expedient for us, that one man should die for the people, and that the whole nation perish not. Caiaphas framed his argument on what was good for the nation. He was cool and calculating. The answer was to commit murder. It was the only honorable thing to do. They had to kill Jesus for the good of the nation. It was better for one man to die to save the nation of Israel, better to sacrifice one man than for the nation to perish at the hands of the Romans. Caiaphas was like the Godfather arranging a murder for hire. This was the sorry state of Judaism in those days. The true religion of Abraham, had all but disappeared. From the beginning of Christ’s ministry Jesus had been a threat to the Scribes and Pharisees. Like the Pope of Rome they had claimed the right to interpret Scriptures but Jesus had the temerity to tell them they were wrong and that their hearts were not right with God and their religion of works righteousness was false. These men knew if they lost control of the Jewish people the Roman government would replace or kill them. Caiaphas won the day. He got what he wanted. He settled the question and from that day forward they plotted to kill Jesus. This was the level of their hatred for Jesus, a hatred that extended to Lazarus too, for in the next chapter they were plotting to kill him along with Jesus because he was causing so many people to believe on Jesus. That’s how much they hated Jesus that was the depth of their unbelief. They were going to kill Jesus and if necessary kill Lazarus too because he was living proof that a miracle had taken place. Caiaphas didn’t realize he was more right than he imagined. When he said it was best that one man die for the people he unwittingly spoke the Gospel. He was right, the whole nation shouldn’t be destroyed; just one man should die; one man should die for sinners, the just for the unjust. The Lamb of God should be sacrificed in the place of guilty sinners. One man should take the punishment of the nation. Better that one would die than they should all die. God in His sovereignty overruled what Caiaphas intended and he spoke the truth in spite of himself. And this spake he not of himself: but being high priest that year, he prophesied that Jesus should die for that nation. And not for that nation only, but that also he should gather together in one the children of God that were scattered abroad. The man who spoke words of hatred and murder unintentionally spoke the life giving words of the Gospel. In spite of himself the High Priest spoke God’s saving word. Jesus would die in place of the nation. Caiaphas was plotting death but God had planned life. Caiaphas was selfishly seeking political gain but God was going to bring spiritual gain to the world. He planned to commit the worst evil upon Jesus but God brought the greatest good from it. They were hoping to spare one nation, Israel, but God sent Jesus to the cross to die for the scattered children of God in every nation and language, and to bring them together and make them one. God was fulfilling His words to Abraham that through His Seed, Christ all the nations of the earth would be blessed. Jesus would be a light for the Gentiles to bring salvation to the ends of the earth. The hatred of the Jewish leaders reflected their unbelief. The carnal mind of man is the enemy of God and this is the condition of all unbelievers. Jesus said the world will hate us just as it hated Him and the Sanhedrin illustrates the level of that hatred. Apart from the grace of God we would all hate Christ just as these men did. Everything we have in the way of faith and understanding is the gift of God. It does not come from us. God deserves all the glory for our salvation. We all have the same seeds of unbelief and pride that filled the hearts of the Scribes and Pharisees. Even good church going people are not immune from pride. The Pharisees were the good church going people of that day. They studied their Bibles, memorized God’s Word, taught in the synagogues, and prayed every day yet behind the appearance of faith and grace were hearts that were cold and dead. Sinful human pride kills saving faith. Pride has often been described as the mother of all sins. It was the sin of pride that caused Satan to be cast out of heaven and it was pride that caused Adam and Eve to fall into sin. It is pride that separates the Christian from His Savior. Faith looks to God for everything we need in this life but pride trusts in me and my own works. The power of God. Only God could accomplish the plan of salvation, only He can apply the Gospel to our hearts. We must never imagine that pride and sin cannot enter our hearts. This is why we must continue repenting and confessing our sins asking God to preserve us in the true faith. The Spirit of God wages war against the pride of our hearts each day. The Word reminds us that pride goes before a fall, and God opposes the proud but gives grace to the humble (Prov. 16:18; James 4:6). But to this man will I look, even to him that is poor and of a contrite spirit, and trembleth at my word (Is. 66:2b). Caiaphas proclaimed the Gospel that day though he had intended words of hatred and murder. Caiaphas was not in control, God was. He was not aware of what the Holy Spirit was doing. As High Priest He was pointing to Jesus. It was the High Priest that had the duty of bringing the blood of the sacrifice to God in the Temple. He would continue offering the blood of atonement until God Himself would come and sacrifice Himself for our sins. But one last time at the close of the Old Covenant, God spoke through the High Priest. From that point on Jesus would fulfill all the symbols and sacrifices and the Old Testament priesthood would come to an end. There would be no more need for sacrifices. All the types and symbols were passing away. Caiaphas revealed why Jesus had to die. It was better in God’s sight that one man die to preserve the nation from death. Not only did the Lord speak the Gospel through Caiaphas He also used him to arrange the details of His death. As High Priest Caiaphas made sure Jesus was put on trial, appeared before Pilate, and was condemned to die on the cross. He reminds us that sin is the universal condition of all men. Sin condemns us to die and go to hell. But God did not want that to happen so He sent His Son to die and to pay for our pride and sin. Jesus was the Messiah that Israel had been waiting for; His was the only blood that could pay for our sins, the only sacrifice that could turn God’s anger away from us, the only atonement that could ever make us friends with God again. Only the blood of the sinless Son of God could save us. The blood of Jesus is worth more than the whole universe. It not only paid for the sins of the nation of Israel but for the sins of the whole world. John wrote: And he is the propitiation for our sins: and not for ours only, but also for the sins of the whole world (I Jn. 2:2). God had always planned to save the Gentiles. Caiaphas prophesied that Jesus would die for every man, woman, and child who would ever live. If God had the power to put the Gospel into the mouth of a man who hated Him He is able to make the Light of the Gospel shine in the darkness of this world, able to save to the uttermost all who come to God through Christ. The Gospel is the power of God unto salvation to everyone that believes, both Jew and Gentile. Our Gospel reading also reminds us that miracles alone do not have the power to convert anyone to Christ. Many of the Jews had witnessed the miracle of Lazarus, a man dead four days, being raised to life. The miracle was unmistakable and undeniable yet the Chief priests and Pharisees would not believe on Christ and ended up committing even worse sins. This is the power of unbelief. Only the Holy Spirit through Word of God can save sinners and bring them to faith. Miracles alone cannot do this. When the Rich Man in hell begged Abraham to send Lazarus the beggar back to his brothers on earth to warn them about hell he argued: But if one went unto them from the dead, they will repent. But Abraham replied: If they hear not Moses and the prophets, neither will they be persuaded, though one rose from the dead (Lu. 16:30-31). Here is the proof of Abraham’s words. Lazarus, the brother of Mary and Martha had been raised from the dead and yet the religious leaders would not believe. And soon Jesus would rise again from the dead and they would still refuse to believe. The fact that you believe on Christ is the Spirit’s work in your life. You have found peace with God and God has forgiven all your sins and granted you eternal life, a new birth, and has declared you His people. Through faith in Christ we who are removed thousands of miles and 20 centuries away from Jerusalem and Caiaphas are now children of God, bought and paid for by the death of Christ. God has made us all one in Christ. The way God looks at it, there is only one Christian Church. We don’t see it that way. We see Lutherans, Baptists, Methodists and Catholics. We see division and discord. We see people who don’t seem very serious about their Christian faith. We can’t see into a person’s heart, only God knows the heart but whenever God sees faith in Jesus Christ He sees a member of His One True Church. In heaven we will all be one. Nothing that separates us now will divide us. We will all enjoy God’s love together forever. All of this will be ours because one man died for the people. God loved His only begotten Son but willingly sacrificed Him on the cross to bring us to heaven. All those who trust in what Christ has done for them will love God and each other forever. We are not told what happened to Caiaphas. As far as we know he never understood who Jesus was or even what he had said that day. God always accomplishes His salvation and guides everything that touches our lives. He causes all things to work together for our good. If Caiaphas did not repent and believe on Jesus as His Savior he died and went to hell. In one last bit of irony, the man through whom God had spoken, the one who held a place of honor and responsibility in the Jewish Church, will hear Jesus say to him on the last day: I never knew you: depart from me, ye that work iniquity (Mt 7:23). One of the great ironies of the Passion is God’s love for us spoken through the mouth of an unbeliever; Amen. Now when Job’s three friends heard of all this evil that was come upon him, they came everyone from his own place; Eliphaz the Temanite, and Bildad the Shuhite, and Zophar the Naamathite: for they had made an appointment together to come to mourn with him and to comfort him. And when they lifted up their eyes afar off, and knew him not, they lifted up their voice, and wept; and they rent everyone his mantle, and sprinkled dust upon their heads toward heaven. So they sat down with him upon the ground seven days and seven nights, and none spake a word unto him: for they saw that his grief was very great. We live in a very friendly age, a time when it seems everyone is on a first name basis. Americans are friendly even to strangers. All of our exchange students over the years have commented on how friendly the people were here compared to their country. Sasha, our Russian exchange student, couldn’t believe I actually greeted strangers on the street or would sometimes ask someone I didn’t know how things were going. He said if you were to do that in Russia get ready to spend the next hour listening to every detail of his life. I assured Sasha that when I asked that question I wasn’t really interested in the details. Bad news travels fast and Job’s three friends heard what had happened to Job, how he lost his entire family and fortune. Job described these men as miserable comforters, which they were (Job 16:2), but they came to Job out of genuine affection. A man once said: A real friend is one who walks in when the rest of the world walks out. Friendship has been studied for years. Most friendships have similar characteristics, affection, sympathy, empathy, honesty, generosity, mutual understanding, compassion, enjoyment of each other’s company, trust, and the ability to be oneself, to express your feelings, and make mistakes without fear of judgment. Job’s friends made some mistakes trying to figure out what had happened to their friend and wrongly interpreted the providence of God which added to his sorrows, but they were true friends nonetheless. Let us examine the characteristics of true friendship. True friendship is proved in times of affliction. Job’s afflictions were of the worst sort, a level of suffering hard to fathom. When his family and friends heard about it they wanted nothing to do with him. Everyone abandoned him. If he was under God’s curse, they were going to avoid him. Job described his situation. He hath put my brethren far from me, and mine acquaintance are verily estranged from me. My kinsfolk have failed, and my familiar friends have forgotten me. They that dwell in mine house, and my maids, count me for a stranger: I am an alien in their sight. I called my servant, and he gave me no answer; I intreated him with my mouth. My breath is strange to my wife, though I intreated for the children’s sake of mine own body. Yea, young children despised me; I arose, and they spake against me. All my inward friends abhorred me: and they whom I loved are turned against me (Job 19:13-19). Later when his circumstances turned around his family and friends came back to comfort him. And the Lord turned the captivity of Job, when he prayed for his friends: also the Lord gave Job twice as much as he had before. Then came there unto him all his brethren, and all his sisters, and all they that had been of his acquaintance before, and did eat bread with him in his house: and they bemoaned him, and comforted him over all the evil that the Lord had brought upon him: every man also gave him a piece of money, and everyone an earring of gold (Job 42:10-11). For I was hungry, and ye gave me meat: I was thirsty, and ye gave me drink: I was a stranger, and ye took me in: Naked, and ye clothed me: I was sick, and ye visited me: I was in prison, and ye came unto me. (Mt. 25:34-36). The righteous will answer, Lord, when did we do all these things for you? And the King will reply: Verily I say unto you, Inasmuch as ye have done it unto one of the least of these my brethren, ye have done it unto me. Jesus is our sympathizing friend. He understands your afflictions and cares for you. For we have not an high priest which cannot be touched with the feeling of our infirmities; but was in all points tempted like as we are, yet without sin (Heb. 4:15). In all their affliction he was afflicted, and the angel of his presence saved them: in his love and in his pity he redeemed them; and he bare them, and carried them all the days of old (Is. 63:9). What a friend we have in Jesus, all our sins and griefs to bear, what a privilege to carry, everything to God in prayer. Christ laid down His life to deliver us from sin, grief, and sorrow. Isaiah wrote: The Spirit of the Lord God is upon me; because the Lord hath anointed me to preach good tidings unto the meek; he hath sent me to bind up the brokenhearted, to proclaim liberty to the captives, and the opening of the prison to them that are bound; To comfort all that mourn; To appoint unto them that mourn in Zion, to give unto them beauty for ashes, the oil of joy for mourning, the garment of praise for the spirit of heaviness. (Is. 61:1-3). True friendship is practical. True friendship is more than words and will seek to help a friend in need. These three men were likely businessmen like Job, possibly farmers and wealthy like their friend and yet they left their homes and businesses to visit Job in his time of trouble. Do you have time for those who are in trouble? The two great commandments of the Law are to love God with all our heart, mind, body, soul and strength and to love our neighbor as ourselves. It is not enough to speak words of comfort if we do not meet the practical needs of our brethren. If a brother or sister be naked, and destitute of daily food, And one of you say unto them, Depart in peace, be ye warmed and filled; notwithstanding ye give them not those things which are needful to the body; what doth it profit? Even so faith, if it hath not works, is dead, being alone (Ja 2:15-17). These men were willing to put Job before their own affairs. When they arrived that day they were greatly distressed when they saw Job. They lifted up their voice and wept for him, and according to the custom of the day, tore their robes and sprinkled dust upon their heads. Job was so disfigured from his grief and from the boils that covered his entire body his friends did not recognize him. Suffering often causes great changes in us. In the Book of Ruth during the time of the Judges, a man named Elimelech, his wife Naomi and their two sons went to live in Moab because of a famine in Israel. Why did Jesus weep? He knew what He was about to do. In a few minutes Lazarus would be brought back to life and the sorrow and grief would be turned into joy, so why weep? Some have suggested He wept because in the death of Lazarus He saw the tragic results of sin, how death had enslaved mankind, a reminder of what He had come to do for us. All that might be true, but I think He wept for another reason. He wept out of sympathy for those whom He loved. The Lord Jesus weeps with those who weep, and grieves with those who grieve. He enters into the joys and sorrows of our life. Jesus told the parable of the Good Samaritan about a man who was beaten by robbers and left for dead on the side of the road. And by chance there came down a certain priest that way: and when he saw him, he passed by on the other side. And likewise a Levite, when he was at the place, came and looked on him, and passed by on the other side (Lu. 10:31-32). These two men, a Levite and a Priest, both religious men, passed by on the other side of the road because they didn’t want to get involved. They had no time for the suffering of a brother. But Christ is our Good Samaritan who found us on the side of the road, beaten and half dead, and He got involved; bandaged our wounds and carried us to the inn where he cared for us and saved our lives and our eternal souls. Jesus is the friend of sinners and the picture of true friendship, the Savior who is always practical, always ready to help others in need. The language of true friendship is often silence. These three men sat with Job for seven days sharing in in his misery and desperation without speaking a word to him. I’m sure they didn’t know what to say which I understand. I never know what to say to someone at a funeral who has just lost a loved one. I’ve learned that when I’m in that situation, to say nothing. These men didn’t know why these things had happened to Job or what they should say, so they remained silent. When we are in that situation we should ask God to give us words to speak to those who suffer. Isaiah wrote: The Lord God hath given me the tongue of the learned, that I should know how to speak a word in season to him that is weary he wakeneth morning by morning, he wakeneth mine ear to hear as the learned. The Lord God hath opened mine ear, and I was not rebellious, neither turned away back. (Is 50:4). A man hath joy by the answer of his mouth: and a word spoken in due season, how good is it! (Prov. 15:23). When we are in distress, God speaks a word in season to us in various ways, through family members, friends and enemies, teachers, mentors, and ministers, and so many others. He speaks to us through His written word, the Bible, which is profitable for doctrine, for reproof, for correction, for instruction in righteousness (2 Tim. 3: 16). The Word of God came in the flesh and dwelt among us in the person of Jesus Christ, the promised Messiah (Jn. 1: 14). Jesus is a word in season! He invites all those who are weary or in distress to Come to Me … and I will give you rest. Take My yoke upon you and learn from Me, for I am gentle and lowly in heart, and you will find rest for your souls (Matt. 11: 28, 29). Christ is the Word in season to weary sinners, the only Word of comfort for those who sorrow. Start by listening to a friend who is grieving. We don’t have to rush in with words of comfort if we don’t know what to say. The fact that we are there means everything to one who is suffering. Silence can be powerful. Then said Pilate unto him, Hearest thou not how many things they witness against thee? And he made no reply; insomuch that the governor marveled greatly (Mt. 27:13-14). When Jesus refused to defend Himself before Pilate it had more meaning to the governor than any defense He might have given. Your presence can mean more to a friend than hundreds of words. Your silence will be golden and the best encouragement they could receive. The same is true of prayer. Rather than searching for things to say to God, learn to wait quietly before Him. Be silent, all mankind, before the Lord: for he is raised up out of his holy habitation (Zec. 2:13). Your Heavenly Father is with you in the midst of your grief when you have no power to read His Word and He is the friend that is closer than a brother (Prov. 18:24). Listen to His voice. Wait on Him. But the Lord is in his holy temple: let all the earth keep silence before him (Hab. 2:20). 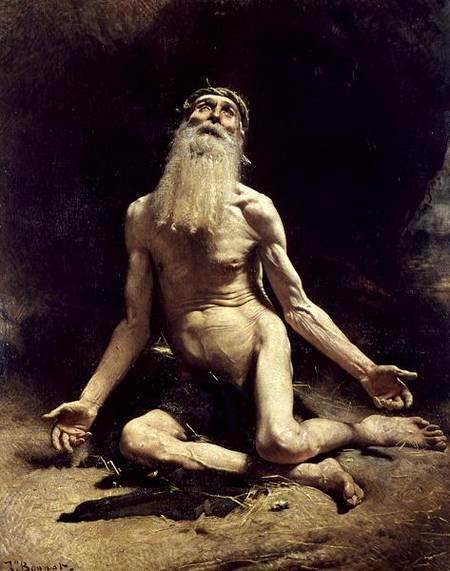 Introductory considerations: Tonight we begin a series of sermons on the Book of Job and we will start with some introductory considerations. The book of Job stands by itself in the Bible unconnected to any other book as part of the poetic literature along with Psalms, Proverbs, Song of Solomon, and Ecclesiastes. There are some things we don’t know about this book, for example we do not know exactly when Job lived. Most scholars think he lived during the days of Abraham which would make this the oldest book in the Bible. We also do not know the author of the book. Some have suggested that Moses helped compile the book in its current form, but no one really knows. But there are things we do know. We know that Job was a real person. We find references to him elsewhere in the Bible. In James 5:11 we read: Behold, we count them happy which endure. Ye have heard of the patience of Job, and have seen the end of the Lord; that the Lord is very pitiful, and of tender mercy. Here the Apostle James uses Job as an illustration of Christian patience in times of suffering and he assumes that his readers were familiar with the story. Another reference to Job is found in Ezekiel 14:14. Though these three men, Noah, Daniel, and Job, were in it, they should deliver but their own souls by their righteousness, saith the Lord God. The prophet Ezekiel said that Israel was so ripe for judgment that even if Noah, Daniel, and Job were present in that day they would not deliver His people from wrath. If Noah and Daniel were real men who actually lived on the earth then Job was also a real person. We also know the Book of Job was an inspired book. In I Corinthians Paul argues that the wisdom of this world is foolishness with God by quoting Job 5:13: for it is written, He taketh the wise in their own craftiness. The words it is written identifies these words as Scripture. Jesus said the Scriptures cannot be broken. The Word of God lives and abides forever and is the source of all doctrine. Job lived in the land of Uz later called Edom, an area located southeast of Israel. There are also things not mentioned in the book. Nothing is said about Job’s lineage, his ethnicity, what part of the human race he was from. There’s no record that he was related to Abraham so He was a believer from among the Gentiles, a reminder to the Jews and to us that it is not our family ties that save us but our knowledge of the true God. You may have come from a godly family and grew up with the Christian faith from your earliest days, but the faith of your parents and ancestors cannot save you. The Jews in Jesus’ day trusted in their race to save them the fact that they were children of Abraham, but race cannot save anyone. There is also no mention of religious ceremony or ritual in the book. Job lived before Moses and the ceremonial Law so his worship was a simple altar and a blood sacrifice, the essence of all true saving religion, and a reminder that ceremonies cannot save us. The story of Job took place before God reduced His Word to writing under Moses. Before that time the true faith was passed down from one generation to another by word of mouth, by tradition, and the natural knowledge of God. The Lord has written the knowledge of Himself in creation and in the heart of every person. (Rom. 2:14-15). God’s revelation can be clearly seen by all men. This reminds us of how fortunate we are to have the Bible, the written Word of God to read and study. Visions and miraculous gifts are uncertain, but the Scriptures are absolutely sure. They tell us who God is, who we are, and what God has done for us in Christ. The theology of the book of Job is drawn largely from the light of nature. In Job you will find descriptions of God’s attributes and perfections, His wisdom, power, glory, and justice, all described with reverence and eloquence. The fact that God created and governs the world is set forth in Job as a powerful incentive for us to fear, serve, and trust in our Creator and Lord. Job is a picture of Gentile piety, a fulfillment of the words of Peter spoken in the House of Cornelius: Of a truth I perceive that God is no respecter of persons: But in every nation he that feareth him, and worketh righteousness, is accepted with him (Acts 10:34-35). Job is also an exposition of divine providence. The writer is seeking to reconcile man’s suffering and affliction in this life with God’s wisdom, purity, and goodness. Let’s examine the person of Job this evening. The mark of a true believer. What was true of Job must be true of your life or you are not a believer. Job feared God. He reverenced God’s majesty, authority and wrath. The fear of God comes from a right view of Him. On Good Friday we considered the thief on the cross, one of the two hardened criminals that were crucified alongside our Lord. At first this man joined the other thief in mocking and jeering at our Lord along with the soldiers and the religious leaders, but then something happened. God revealed Himself to this man and he turned to the other thief and rebuked him, saying, Dost not thou fear God, seeing thou art in the same condemnation? And we indeed justly; for we receive the due reward of our deeds: but this man hath done nothing amiss. And he said unto Jesus, Lord, remember me when thou comest into thy kingdom. And Jesus said unto him, Verily I say unto thee, Today shalt thou be with me in paradise. This man suddenly saw Jesus as his Creator, Judge, and King and He was transformed from a mocking wicked sinner into a man who feared God. Man by nature has no fear of God. As it is written, There is none righteous, no, not one: There is none that understandeth, there is none that seeketh after God. They are all gone out of the way, they are together become unprofitable; there is none that doeth good, no, not one. Destruction and misery are in their ways: And the way of peace have they not known: There is no fear of God before their eyes. We teach our children to fear certain things. We warn them not to play with fire or they will get burned. But there is always that one child who will not learn from the experience of others and has to find out the hard way. After they get burned they learn why Mom and Dad warned them. When God reveals Himself to us by His Spirit we learn to fear Him. The fear of God is the foundation of all true religion. David wrote: The fear of the Lord is the beginning of wisdom (Ps. 111:10). The word wisdom in Psalms and Proverbs often describes a saving relationship to God by faith through the sacrifice for sins, a description of the faith of Job. Without the fear of God there will be no holiness. Holiness is obedience to God’s Word in our heart and life and is essential to the life of the Christian. Follow peace with all men, and holiness, without which no man shall see the Lord (Heb. 12:14). Holiness comes from saving faith and godly fear and though our holiness is never perfect or complete in this life holiness must be part of our life if we claim to be saved. Jesus said: Blessed are the pure in heart: for they shall see God (Mt. 5:8). God gives us a fear and love of Him. The fear of God is missing in much of modern church. God is seen as an old grandfather sitting in a rocking chair in heaven who wants His children to clap their hands, rejoice and be happy 365 days a year. This is a false view of God and of the Christian life. Today’s worship is all about the worshipper how he feels, what he thinks, and what he wants. Along with this is the popular notion that you can live as you please and still go to heaven. This does not reflect the God of the Bible. And now, Israel, what doth the Lord thy God require of thee, but to fear the Lord thy God, to walk in all his ways, and to love him, and to serve the Lord thy God with all thy heart and with all thy soul (Deut. 10:12). God is holy! He is a consuming fire! He will not tolerate sin and will avenge those who rebel against Him. He is a God of mercy and grace but a God to be feared. Those who come to Him through the blood of His Son will find His mercy but those who reject His offer of salvation will suffer His wrath. In Ecclesiastes King Solomon writes: Let us hear the conclusion of the whole matter: Fear God, and keep his commandments: for this is the whole duty of man (Eccl. 12:13). You will never obey God until you fear God and you will never fear God until you know Him. When Saul was on the road to Damascus to persecute and arrest believers in that city the Lord revealed Himself to him with a bright light: And he fell to the earth, and heard a voice saying unto him, Saul, Saul, why persecutest thou me? And he said, Who art thou, Lord? And the Lord said, I am Jesus whom thou persecutes. When Saul met the Lord Jesus that day he believed on Christ and began to fear the Lord. The life of a true believer: The fear of God directed Job’s conduct. Our text describes him as perfect before God. The word perfect does not mean sinless or without fault, it means he was complete and whole. Job attended to all matters of religion, nothing was left undone. He didn’t obey certain areas of God’s will while ignoring others. His faith and obedience extended to every area of his life. This was God’s testimony of him. Some Christians obey certain areas of God’s Law and ignore the rest. They are holy on Sunday morning but Monday through Saturday they are quite different. Their religion never reaches the rest of their life, never touches their business practices, so they take shortcuts, misrepresent their product, or cheat customers. Others allow personal relationships to fall apart without trying to mend them. Others steal time and money from God by neglecting the church. Still others separate their Christian faith from politics, the things of this world, what they consider to be secular but the Christian faith speaks to every area of our life, how we are to think, speak, and live, even how we vote. Any religious profession that does not extend to all areas of life is phony and hypocritical. Job’s religion was complete, no hidden areas, no deception, no double life, and no hypocrisy. He did not have a Sunday face and another face for the rest of the week. He was the same on the outside as on the inside. He did not obey God’s Law to be seen of men, his life reflected who he really was. We are saved by grace through faith apart from our works but the grace of God that saves always leads us to obey God’s Word or we have not received the grace of God. If you claim to possess the grace of God while continuing to live in deliberate willful sin, you are a stranger to God’s grace. The grace you claim to have is the grace you bestowed upon yourself. In other words, you forgave your own sins. Only the believing obey and only the obedient believe. The only way you can obey God’s Word is by faith in Christ which gives the strength to keep His commandments. But you have not truly believed on Christ until you begin to obey His Word. God can give us a heart that fears and loves Him. Job was perfect and complete in his religious duties and was also upright. He was honest and straightforward with God and men in every area. He was faithful to his promises and commitments. The word upright means to be straight or on the level. David wrote: Be glad in the Lord, and rejoice, ye righteous: and shout for joy, all ye that are upright in heart (Ps. 32:11). God loves justice and righteousness and He demands these qualities in the hearts and lives of His people. Job had a reputation as an honest man. That was his character. You could take him at his word. So we ask the question: Do you have a good reputations with men? Can people trust your word? Are you honest in all your dealings? If so, then like Job, you have the marks of a true believer. Solomon wrote: A good name is rather to be chosen than great riches, and loving favor rather than silver and gold (Prov. 22:1). Finally, we read that Job eschewed or avoided evil at all costs. His fear of God caused him to avoid sin, even the appearance of evil. The fear of God is rooted in His omniscience the fact that God knows everything you do and say even the deepest thoughts of your heart. The eyes of the Lord are in every place, beholding the evil and the good (Prov. 15:3). The fear of the Lord is to hate evil (Prov. 8:13). By mercy and truth iniquity is purged: and by the fear of the Lord men depart from evil (Prov. 16:6). The fear of God will protect you in times of temptation. When Joseph was tempted by Potiphar’s wife to commit adultery, he had the power to say no because he feared God. He said to her: How then can I do this great wickedness, and sin against God? (Gen. 39:9). Parents, you can’t be with your children every moment of the day, therefore teach them the fear of the Lord, so that when temptation comes they will have the strength to stand. Job is an example for us though he had many weaknesses and frailties. Job teaches us that God’s standards do not change and that we can live for God in an evil world. Job went through a time of suffering for his greater glory and in this he is like Christ who for the joy that was set before him endured the cross. Like Job, Jesus was persecuted for a time by men and the devil and seemed forsaken of God too. The main lesson of this book is summarized in the words of David: Many are the afflictions of the righteous: but the Lord delivereth him out of them all (Ps. 34:19). Job introduces the subject of suffering in the Christian life. Why do some people suffer and others do not? We do not know. What we do know is that God is too wise to be wrong and too kind to be cruel. He is the sovereign God who promises to cause everything we go through in this life to work for our good. Job did not understand why he was suffering but he trusted in God. At one point he said: Though He slay me yet will I trust in Him (Job 13:15). Job’s friends tried their best to figure out why he was going through all these trials and afflictions. What they concluded was generally true but it was not true in the case of Job. It is true that God punishes the wicked and rewards the righteous, but Job was a righteous man. Sometimes our theological perspective cannot explain divine providence, we are forced to simply trust in the Lord in spite of our circumstances. Like Abraham we must believe God’s promise regardless of what we see around us. In the end, the trial of Job’s faith being much more precious than of gold that perisheth, though it be tried with fire, was found unto praise and honor and glory of God (I Pet. 1:7). In the end God was gracious and merciful to Job and rewarded him with even more than he had before. May God grant us the patience of Job as we face the trials and afflictions of life; Amen! Then Job arose, and rent his mantle, and shaved his head, and fell down upon the ground, and worshipped, And said, Naked came I out of my mother’s womb, and naked shall I return thither: the Lord gave, and the Lord hath taken away; blessed be the name of the Lord. In all this Job sinned not, nor charged God foolishly. Then said his wife unto him, Dost thou still retain thine integrity? curse God, and die.But he said unto her, Thou speakest as one of the foolish women speaketh. What? shall we receive good at the hand of God, and shall we not receive evil? In all this did not Job sin with his lips. Why should we study the book of Job? What could a book written thousands of years ago about a man who lived on the other side of the world possibly have to say to us? This book is part of holy Scripture part of the Old Testament canon, and as such is profitable to us for doctrine, reproof, correction, and instruction in righteousness (II Tim. 3:16). Job is part of the Word of God that lives and abides forever. Scripture reveals truths about God, about ourselves, and about our lives in this world that we would not know in any other way. For whatsoever things were written aforetime were written for our learning, that we through patience and comfort of the scriptures might have hope (Rom. 15:4). Job was an Old Testament child of God saved by grace through faith in Christ, in exactly the same way as we are. He was a man who feared God and walked in the forgiveness of sins the promise of God attached to the sacrifice for sins. God testified that Job’s faith was perfect and complete, extending to every part of his life. Everything in his life was directed by the Word of God. The Lord Himself said Job was an honest and upright man who avoided evil at all costs and God loved and blessed him in every way. Job was a righteous man and also very rich, a rare combination. His great wealth made him a very powerful man in that part of the world. God also blessed him with a large family, seven sons and three daughters, along with many servants. His substance also was seven thousand sheep, and three thousand camels, and five hundred yoke of oxen, and five hundred donkeys, and a very great household; so that this man was the greatest of all the men of the east. In the first chapter of the book we see Satan appearing before God and the Lord boasting about His servant Job. Satan in turn, accused Job of being mercenary, of serving God for money. And the Lord said unto Satan, Hast thou considered my servant Job, that there is none like him in the earth, a perfect and an upright man, one that feareth God, and escheweth evil? Then Satan answered the Lord, and said, Doth Job fear God for nought? Hast not thou made an hedge about him, and about his house, and about all that he hath on every side? thou hast blessed the work of his hands, and his substance is increased in the land. But put forth thine hand now, and touch all that he hath, and he will curse thee to thy face. The devil said to God that anyone would serve Him if he could get rich in the bargain, but take away the money, the possessions and the blessings and Job will curse you to your face. You know the rest of the story. The Lord allowed Satan to take away Job’s riches, his livestock was stolen, his servants were killed, and all of his children died when a storm collapsed a house they were in but through it all Job refused to charge God foolishly. So the devil returned and challenged God a second time to take away Job’s health and he would curse him. Satan was given permission to afflict Job with painful boils from the sole of his foot to the top of his head a condition so severe even his wife told him to curse God and die. Here we see the work of the devil in slandering us before God and destroying our lives in this world. But Satan could only do what God permitted. God rules over Satan and he has only a limited power over our lives, and through it all God preserves us and uses our afflictions for our ultimate good. God in His wisdom allows us to go through difficult times, afflictions, and trials, but He limits what the devil can do. Job’s trials were especially difficult because they came upon him so suddenly, so unexpectedly and out of the blue. We are able to read the first two chapters and know what was going on behind the scenes, how God allowed Satan to try him, but Job didn’t know the back story. We also know about God’s high opinion of Job but Job didn’t know this. We know how the story ends. It’s always easier to go through a trial or affliction when we know it’s going to end at some point, but Job did not know when his situation was ever going to end. We have also read the end of the book where God blessed Job with more riches and possessions than he had before and gave him more beautiful children, another 140 years of life and allowed him to see four generations of his descendants, but Job didn’t know the end of the story. Let’s examine some lessons that we learn from Job? God is sovereign over wealth: God gives riches and wealth according to His will. But thou shalt remember the Lord thy God: for it is he that giveth thee power to get wealth, that he may establish his covenant which he sware unto thy fathers, as it is this day (Deut. 8:18). We hear a lot of complaining about rich people today, the so called 1% who control all the wealth. Some think that socialism is the answer, the envy of the rich and legalized theft, empowering the government to steal from some to give to others, but this is false. Many of God’s people in the Bible were wealthy, Abraham, Solomon, and David. Both riches and honor come of thee, and thou reignest over all; and in thine hand is power and might; and in thine hand it is to make great, and to give strength unto all (I Chron. 29:12). But there are many rich people today who have become wealthy by theft and misusing the system. Our nation is ruled by the power of money. Washington DC is full of corruption, crony capitalism, bribery, and theft and there is little we can do about it. But Job was different. He was a godly rich man which was unusual. Jesus warned of the deceitfulness of riches that choke the Word of God planted in our hearts (Mt. 13:22). Riches have the power to rob you of your salvation if you allow it. Money makes people think they are self-sufficient and don’t need of God and they end up trusting and serving mammon. This was not true of Job. He was not deceived by his wealth. Jesus warned the love of money can separate us from God. No servant can serve two masters: for either he will hate the one, and love the other; or else he will hold to the one, and despise the other. Ye cannot serve God and mammon (Lu. 16:13). Jesus said to His disciples: How hard it is for those who have riches to enter into the kingdom of God! And the disciples were astonished at his words. But Jesus answereth again, and saith unto them, Children, how hard is it for them that trust in riches to enter into the kingdom of God! It is easier for a camel to go through the eye of a needle, than for a rich man to enter into the kingdom of God. And they were astonished out of measure, saying among themselves, Who then can be saved? And Jesus looking upon them saith, With men it is impossible, but not with God: for with God all things are possible (Mark. 10:23-27). It’s not impossible for a rich man to be saved, but it is difficult. Job was a rich man who walked with God by grace through faith (Eph. 3:16) and did not trust in his riches. Paul wrote to Timothy: Charge them that are rich in this world, that they be not high minded, nor trust in uncertain riches, but in the living God, who giveth us richly all things to enjoy (I Tim. 6:17). Earlier Paul warned y: For the love of money is the root of all evil: which while some coveted after, they have erred from the faith, and pierced themselves through with many sorrows (I Tim. 6:10). We are living in a nation that worships material riches and possessions. The goal of most Americans is to be prosperous and enjoy the good life, but many people today are enslaved to debt. They are chasing the American dream, surrounded by electronic gadgets, cars, boats, ATVs, and snowmobiles but in terms of what is truly important, namely meaningful work, leisure time, stable marriages, lasting friendships, and actual ownership of land (not mortgages), they are paupers. I read recently that loneliness in America is epidemic. Many Americans are friendless, loveless, and adrift. They are told to celebrate the fact they live in the richest country in the world, but debtors are not rich. Our nation is enslaved to debt, the worst poverty there is. Debt enslaves the debtor and robs him of the peace and contentment God intended (Hoffman). God gave Job everything he had. But when someone seeks after riches more than he seeks after God and trusts in mammon (material possessions) more than he trusts in God the love of money will destroy his soul. Rich people have an obligation to the poor. Job was rich but he was also generous to the poor. He told his friends he had never withheld anything necessary from the poor and had never trusted in his gold (Job 31:17ff). The trials of Job remind us that riches and wealth will not protect you from afflictions calamities and trouble. Everyone goes through afflictions at various times. Trials and chastening are the common experience of all of us but God promises to preserve His people in the midst of them as He did with Job. God blessed Job with spiritual riches. Along with money and possessions God gave Job the riches of His grace in Jesus Christ (Eph. 1:7). Christ came to make us rich in grace. For ye know the grace of our Lord Jesus Christ, that, though he was rich, yet for your sakes he became poor, that ye through his poverty might be rich (II Cor. 8:9). Job had the riches of the Gospel, the knowledge of God, and the wisdom to live in the world, without which a man is impoverished. Lazarus was so poor he had to beg for food at the gate of the Rich Man but in reality, Lazarus was richer and when he died, his true riches were revealed; the riches of his inheritance in the saints (Eph. 1:18b). What we see in this life does not tell the whole story. True wealth lies beyond this life. Lay not up for yourselves treasures upon earth, where moth and rust doth corrupt, and where thieves break through and steal: But lay up for yourselves treasures in heaven, where neither moth nor rust doth corrupt, and where thieves do not break through nor steal (Mt. 6:19-20). Spiritual riches cannot be taken away but our condition in this world can change in an instant. Solomon wrote: Boast not thyself of tomorrow; for thou knowest not what a day may bring forth (Prov. 27:1). None of us know what tomorrow may bring. Our circumstances can change overnight. For bodily exercise profiteth little: but godliness is profitable unto all things, having promise of the life that now is, and of that which is to come (I Tim. 4:8). Here Paul reveals a basic rule of life, that godliness will bring a blessing from God in this life and in eternity. But sometimes God temporarily suspends this rule as He did in the life of Job. The same thing happened to Joseph. There is no record of sin in Joseph’s life. We know he was a sinner just like all of us, but the Bible does not reveal anything Joseph did that was wrong, yet look at what happened to him. He was betrayed by his brothers, sold into slavery, falsely accused, imprisoned, forgotten, and finally he was released and promoted to leadership in Egypt. But also notice something about the life of Job. What Job was in prosperity he was in adversity. He worshiped God before his affliction, offering up sacrifices for his children and interceding for their souls, walking humbly with the Lord each day and after he had lost everything he was still the same man. Then Job arose, and rent his mantle, and shaved his head, and fell down upon the ground, and worshipped, And said, Naked came I out of my mother’s womb, and naked shall I return thither: the Lord gave, and the Lord hath taken away; blessed be the name of the Lord. In all this Job sinned not, nor charged God foolishly. Job believed that God had the right to take all of his possessions away, even his children. The Lord has given you children and commands you to raise them according to His will, but could you bless the Lord if He took them away? Or would you charge God foolishly. Job reacted passionately when he heard his children had been killed. He tore his garment and shaved his head and fell down upon the ground and worshipped but he did not sin with his lips or charge God foolishly. Not one sinful word passed his lips. He never challenged God’s mercy, His justice, or His love. How can we weather such a storm in our life? The first thing we must have is faith in the God who does not change. Faith comes from God’s Word which reveals God as immutable, the same yesterday, today and forever. His Word is true regardless of changing circumstances. I had a friend recently who lost all of his money because of bad investments who killed himself. When a man worships mammon, when money is his god, when the money is gone his god is dead and he has nothing left to live for. The second thing we need is knowledge. The problem with many Christians is they do not know the God of the Bible. Whenever we have a sketchy or incomplete knowledge about anything we will conclude the wrong thing. Finally, we need We must wait for God’s time. He causes all of our afflictions, chastening and trials to work for our eternal good. The devil was waiting for Job to say one word against God, to offer one complaint but he did not murmur or accuse God. When we speak against God it pleases the devil. The God of Job still lives today. As we consider Job and the times in which he lived, it is important to remember that Job had no written revelation of God. He had no Bible no historical record of God’s mercy and grace toward His people in the past, no understanding of God’s Covenant, and no encouragement from His Word whereas we have the full revelation of God in Jesus Christ recorded in His Word. Job worshiped God with an inferior means of grace. There were no churches, no public preaching, no pastors, no sacraments, no Lord’s Day, and no divine service. Job was not surrounded by other believers to encourage him and the three friends he had were more like enemies than friends. And finally, he didn’t have the record of the suffering Savior, Jesus Christ who sympathizes with our troubles and invites us to bring all our troubles to Him in prayer. For we have not an high priest which cannot be touched with the feeling of our infirmities; but was in all points tempted like as we are, yet without sin. Let us therefore come boldly unto the throne of grace, that we may obtain mercy, and find grace to help in time of need (Heb. 4:15-16). We have the promise of God when we go through afflictions. For our light affliction, which is but for a moment, worketh for us a far more exceeding and eternal weight of glory; While we look not at the things which are seen, but at the things which are not seen: for the things which are seen are temporal; but the things which are not seen are eternal (II Cor. 4:17-18). God has given us all that we need for life and godliness through the promises of His Word. May God grant us patience in our trials as we trust in Him; Amen. The thief on the cross was about to die. His life no doubt flashed before his eyes on that Friday afternoon and he was not happy with what he saw. Who was this man? We don’t know very much about him. He only appears in history for this one unforgettable moment. Why was he being crucified? Luke calls him a malefactor, which means criminal, evildoer, or one who commits crime. Matthew and Mark describe him as a thief. Whatever his crimes we know they were serious. The Romans reserved crucifixion for the very worst criminals in the Empire. He was certainly a thief, but it is likely his crimes were much more serious. Some think he might have been a political terrorist who had been engaged in acts of rebellion against the Roman government. Most terrorists in that day were also assassins who targeted Roman officials, violent men engaged in all manner of criminal behavior. We don’t know exactly what he had done but we do know that his crimes caused the Romans to sentence him to the worst death man has ever invented. He knew that he deserved the punishment he was receiving. We receive the due reward of our deeds: but this man hath done nothing amiss (Lu. 23:41). Some have suggested that the two thieves crucified with Jesus had been in league with Barabbas the murderer and insurrectionist that Pilate had released earlier that morning at the request of the mob but we do not know. But something happened to this man as he hung on the cross that day. The Penitent thief had a change of heart. This man had likely never heard of Jesus before and had never thought seriously about his soul. How does a man with no religion come to the conclusion that the bloodied and beaten man hanging next to him was the Savior and King of the world? His conversion may have begun when he heard Jesus speak His first words from the cross. And when they were come to the place, which is called Calvary, there they crucified him, and the malefactors, one on the right hand, and the other on the left. Then said Jesus, Father, forgive them; for they know not what they do (Luke 23:33-34). Jesus had taught His disciples to forgive their enemies and on that day He showed us how. When Jesus forgave the men who were putting Him to death it proved His divinity. Even the Centurion in charge of the crucifixion confessed: Truly this was the Son of God. No mere human being could speak such words of forgiveness. His words transcend the love and goodness of humanity. None of us could have spoken these words if we found ourselves in similar circumstances. It was after Jesus had spoken the words of forgiveness that the penitent thief turned to Jesus and said: Lord, remember me when thou comest into thy Kingdom. And Jesus said unto him, Verily I say unto thee, Today shalt thou be with me in paradise. What does these words teach us? The first thing we learn is that at death the soul of the believer enters into Paradise at once. There is no Purgatory, no stopping off point between earth and heaven where the soul of man dwells for a time before going on to be with the Lord. Paul writes: To be absent from the body is to be present with the Lord. The Christian’s hope is the finished work of Christ for sinners. If going to heaven is dependent upon my works my salvation would be uncertain. This story also teaches us that it is never too late to turn to Christ in faith, God is always ready to receive penitent sinners, always willing to forgive their sins for Christ’s sake. All that the Father giveth me shall come to me; and him that cometh to me I will in no wise cast out (John 6:37). This man had lived a godless wicked life and was headed for hell until his very last hours on earth. At the very end of his life by simple faith he escaped hell and entered paradise with Jesus his Savior. God drew this miserable wretched sinner to Himself by opening the eyes of his soul, and granting him the gifts of repentance, faith and forgiveness. How was this man saved? Jesus said: No man can come to me, except the Father, which hath sent me draw him: and I will raise him up at the last day (John 6:44). Only the Holy Spirit can awaken a soul dead in trespasses and sins and cause him to recognize his need of salvation. Only the Holy Spirit can cause a sinner to believe in the Lord Jesus Christ to be saved. We also see beyond all doubt that salvation is by grace through faith apart from human works! Therefore by the deeds of the law there shall no flesh be justified in his sight (Rom. 3:20). For as many as are of the works of the law are under the curse: Christ hath redeemed us from the curse of the law, being made a curse for us: for it is written, Cursed is every one that hangeth on a tree (Gal. 3:10, 13). What good works did this man do that day to earn his place in Paradise? What works could he do? He did nothing to be saved! He could do nothing to make himself better in God’s sight. He was totally dependent upon Jesus as his hope for eternity. He simply believed on Christ and was gloriously saved. For by grace are ye saved through faith; and that not of yourselves: it is the gift of God: Not of works, lest any man should boast (Eph. 2:8-9). The way to salvation is not found in our good works but in repentance and faith in Jesus Christ. Finally, the Penitent Thief proves to us that even the vilest sinner can find salvation, forgiveness and cleansing in Jesus Christ. The Lord promised through the Prophet Isaiah: Come now, and let us reason together, saith the Lord: though your sins be as scarlet, they shall be as white as snow; though they be red like crimson, they shall be as wool. (Is. 1:18). Only the blood of Christ can wash our sins away. What other lessons are contained in this story? The words of our Lord to the Penitent thief illustrate that the answers to our prayers often exceed our expectations. This man’s request was rather vague. He simply asked Jesus to remember him. He did not ask for a special place of honor in Christ’s kingdom, he did not ask to be rescued from the cross or to escape the penalty he was suffering. He did not ask to escape the justice that was waiting for him in the next world, he simply asked our Lord not to forget him when He came into His Kingdom. It was a modest request. But listen again to our Lord’s reply! Today, thou shalt be with me in paradise! Jesus did not say, Yes, I’ll remember you, which is all anyone would have expected under the circumstances, instead Jesus gave him an answer greater than anyone could have imagined or expected. Jesus assured this wicked miserable condemned sinner that TODAY he would be with Him in paradise. Jesus did not promise to give him this blessing in the distant future for he would be with Christ today! Jesus promised to take this man, not to some vague uncertain place, but to Paradise, that place of eternal joy and peace, which God has prepared for those who love Him. Where else do we read about Paradise? The Bible begins with Adam and Eve living in paradise in the Garden of Eden. When man fell into sin he was driven from Paradise under the curse of sin and death. Because of man’s sin God cursed man’s work in the world. The fall of Adam and Eve was paradise lost, but the death of Jesus Christ marked the beginning of paradise regained. Christ earned new life and perfect righteousness for us. For as in Adam all die, even so in Christ shall all be made alive (I Cor. 15:22). For as by one man’s disobedience many were made sinners, so by the obedience of one shall many be made righteous (Rom. 5:19). We are new creations in Jesus Christ. Therefore if any man be in Christ, he is a new creature: old things are passed away; behold, all things are become new (II Cor. 5:17). The Apostle John described the New Heavens and New Earth at the end of time. And I saw a new heaven and a new earth: for the first heaven and the first earth were passed away; and there was no more sea. And I heard a great voice out of heaven saying, Behold, the tabernacle of God is with men, and he will dwell with them, and they shall be his people, and God himself shall be with them, and be their God. And God shall wipe away all tears from their eyes; and there shall be no more death, neither sorrow, nor crying, neither shall there be any more pain: for the former things are passed away. And he that sat upon the throne said, Behold, I make all things new. (Rev. 21:1-5). By faith in Christ the believer enters paradise here and now and after death will dwell in heavenly Paradise for eternity. But as we consider what Christ has given us through His death and resurrection how often do we live in spiritual poverty? We live without faith, love, courage, or hope, underestimating what God can and will do for us when the New Testament is filled with magnificent promises. The Bible reveals that we are more than conquerors in Christ, that we sit in the heavenly places with our Savior, and are filled with all the fullness of God, but most of us do not experience or expect these things. The Bible tells us that we have not because we do not ask in faith! God is ready to do exceeding abundantly beyond all we could ask or think and if we would only pray we would see God at work in our behalf. Like the Penitent thief, if we would simply ask to be remembered He would give us paradise. But rather than boldly approaching the Throne of Grace we go through each day battered and bruised by the events of our life. We do not see God in His magnificence and glory but by the measure of our own timidity and skepticism We need to hear God’s Word once more: He that spared not His own Son, but delivered Him up for us all, how shall He not with Him also freely give us all things (Rom. 8:32). What would happen if we truly prayed for great things, for things as high as we could hope for, what answers might God give us? We often underestimate God’s gifts to us because we do not connect them with what God is willing to give us today. This was the thinking of the penitent thief. Lord, remember me when you come into your kingdom. I’m sure he did not expect to receive an answer anytime soon. After all, a crucified Savior does not become a king overnight. But our Lord replied: Today thou shalt be with me in paradise. Christ’s promise does not refer to the place they were going after death but to the new relationship they had just entered by faith. To be with Jesus in paradise is a promise for the future but also a possibility for the present! To be with Jesus by faith is to be in paradise. After death our experience of paradise will be more complete, but there is no heaven or paradise after death for those who have not experienced it here. The dying thief did not begin his experience of paradise after death he began it the moment he recognized Jesus as his Savior. When his spirit left his body that day he simply went on to a greater realization of what had already begun in his heart the moment he believed on Christ. Our relationship with Christ today means that it is possible even in this life, in the midst of affliction, trial, and grief to be filled with strength, confidence, and peace. This is the paradise we live in today through faith while still part of this sinful world, a life of grace and forgiveness. Where sin abounded, grace did much more abound. God’s love is always redeeming us from sin.